Wakehurst FC manager Ian Gregg was the special guest at the senior function, held at the Michelin Athletic Club. Other guests included Dougie Stevenson and Niall Swann from Wakehurst FC and Paul Frew MLA. Gregg said that the process is now in place for young players to join Northend and have the opportunity to progress into playing for Wakehurst FC In Irish League Football. Gregg went on to explain that playing regularly in the highly competitive Championship 2, gives players the opportunity of using it as a stepping stone to progressing to the Premiership. Northend Chairman, Johnny Sayers, welcomed the large crowd of parents, coaches and players attending on both nights, in what has been Northend’s largest ever attended Awards Nights. He gave a brief summary of another successful year’s activities for Northend United, including the Club being the first in Northern Ireland to achieve the Irish FA’s Club Excellence Mark, thus setting the standard for other club’s to achieve. 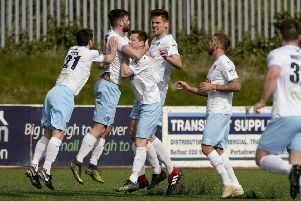 Northend coaches Alex McDonald, Gordon Patterson, Alan Bristow, Uel Magill, Brian Martin, John Devlin, Davy Wylie, Mark Lecky, Johnny Sayers and Stephen White all gave an account of their team’s performances throughout the season. In addition to the normal awards, Northend’s Football Development Officer, John Devlin, presented Mark Lecky, with a retiring gift and thanked him for all his support and commitment to the Club. The Club also presented current Wakehurst player, Niall Swann, with an award in recognition of his achievements with Northend, where he had many successful seasons. Most Improved - Garron Donnelly; Clubperson of the Year - Clodagh Maguire; Players’ Player of the Year - Lewis McDonald; Player of the Year - Mark Campbell. Pumas Merit Award - Carter Reid, Conor O’Hara; Top Goalscorer - Callum Burnside, Daniel Patterson; Players’ Player of the Year - Pearse McAuley, Paidin Mitchell; Player of the Year - Pol Pius Donnegan. Most Improved - PJ McDonnell, Zack Erwin; Best Newcomer - Shea O’Broin; Clubman of the Year - Ryan Campbell; Top Goalscorer - Jay McKeown; Player of the Larne Sevens - Jay McKeown; Players Player of the Year - Ben O’Neill; Player of the Year - Stevie Bristow. Most Improved - Calum McMurray, David McKay; Best Newcomer - Jack McIlhatton; Clubman of the Year - Peter Bristow, Corey McMillan; Top Goalscorer - Lewis Hector; Player of the Larne Sevens - David Magill, Owen Campbell; Players’ Player of the Year - Kevin Cosgrove; Player of the Year - Jack Adams, Curtis Wilson. Most Improved - Coire Mellon, Sam Crawford; Best Newcomer - Jack Connor; Clubman of the Year - Darragh Killough; Top Goalscorer - Niall Devine; Players’ Player of the Year - Niall Devine; Player of the Year - Ciaran Martin, Cal O’Brien. Most Improved - Jamie Montgomery; Best Newcomer - Ronan McKillop; Clubman of the Year - Jamie Morrow; Top Goalscorer - Patrick Ferris; Players’ Player of the Year - Patrick Ferris; Player of the Year - Calum Kilgore. Most improved - Ross Gamble, Callum Forsythe, Josh Coates; Best Newcomer - Ryan Mark; Clubman of the Year - Charlie Metrustry; Top Goalscorer - Conor McDonald; Players’ Player of the Year U13 - Jason Givens; Player of the Year - Jason Givens. Most Improved - Robbie Jones; Best Newcomer - Ryan Lorimer; Clubman of the Year - Tom Patchett; Top Goalscorer - Robert Iovu; Players’ Player of the Year - Ryan Lorimer; Player of the Year - John Brady and Robert Iovu. Most Improved - Ben McGarvey; Best Newcomer - Jacob Penny; Clubman of the Year - Aaron Campbell; Top Goalscorer - Kuba Babuszewski; Players’ Player of the Year U15 - Josh Mark; Player of the Year - Josh Mark and Declan Dobbin. Most Improved - Bradley Cairns; Best Newcomer - Jamie Houston and Lee McAllister; Clubman of the Year - Ryan McKenna; Top Goalscorer - Zack Herbison; Players’ Player of the Year - Sam Bennett; Player of the Year - Tom Campbell and Robbie Dennison. Kathleen Gordon Memorial Shield – Oliwer Maka; Coach of the Year – Ally McGarry; Team of the Year – U10s.